Bob Sibold of Lafayette found this 1966 Chevy C-10 Pickup in Oregon. 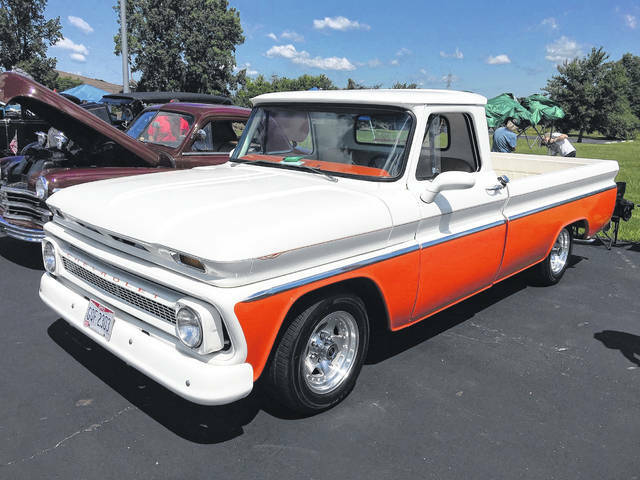 LAFAYETTE — Bob Sibold, of Lafayette, brought his 1966 Chevy C-10 Pickup to the Lima Chevrolet Cadillac Charity Car Show in June. He has owned this truck for three to four years. “It was a rust-free 1966 Chevy Truck from the state of Oregon. These trucks were prone to rust in this area. You can’t find a good one,” said Sibold. Chevy is celebrating 100 years of truck history this year, 2018. The company produced more than 85 million trucks in that century. The Chevy C-10 is one of the most popular trucks for Chevy. The C-10 is a half-ton, light-duty pickup. Sibold’s truck had the original sky blue paint when he bought it. He said he’s in the orange phase now and so had it painted the orange and white. The truck contains all late model drive train, and he’s had it lowered. https://www.limaohio.com/wp-content/uploads/sites/54/2018/10/web1_Chevy-C-10-Pickup.jpgBob Sibold of Lafayette found this 1966 Chevy C-10 Pickup in Oregon.